The BattleTech board game, also referred to as Classic BattleTech or "CBT" for short (see History below), is a table-top wargame simulating combat between futuristic mechanized forces in the fictional BattleTech universe. Originally published by FASA Corporation, the first edition was named Battledroids, but the game was renamed BattleTech from the second edition onwards. BattleTech, 2nd Edition, with its updates to the sometimes unclear or erroneous rules and record sheets from Battledroids, is generally considered the baseline game, and Battledroids merely a prototype or percursor. The highly successful setting spawned numerous spin-off games, novels, etc. and established itself as a brand name (see BattleTech). The game is currently owned by Topps, and produced under license by Catalyst Game Labs. BattleTech is a turn-based, multiplayer game, typically played on a map divided into hexagonal grids with figurines or counters representing the various units. Paper record sheets provide detailed information about each unit, including its armament, armor and equipment, and are used to track damage, heat buildup, ammunition and various other data. Players use two six-sided dice to determine variable results, such as whether a shot strikes its target and the location it hits. Of the units used in the game, the most common are the eponymous BattleMechs, large, semi-humanoid fighting machines controlled by human pilots. While pre-designed 'Mechs, vehicles and other military units are provided with the game, a complex system of design rules allows players to create their own custom units even in the introductory boxed set. This engineering facet of the game has remained enduringly popular with players. 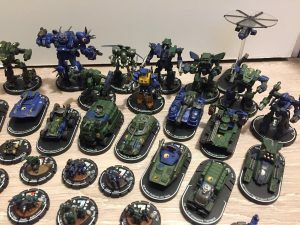 WizKids created a new BattleTech game line called MechWarrior: Dark Age which employed the substantially different Clix game rules and had only superficial similarities with BattleTech as it was known until then. To avoid conflict in the shared setting, the new game and the new novel line accompanying it was set in ca. 3135, roughly 70 years after the BattleTech timeline at the time. The 70-year gap allowed for some substantial changes to the overall setting and a 'fresh start'. The creation of the MechWarrior: Dark Age spin-off brand led to a renaming of the MechWarrior Role Playing Game into "Classic BattleTech RPG" for the reprint of the third edition, and "A Time of War" (previously the title of the introduction) for the fourth edition. ROC discontinued their MechWarrior series of novels in the classic setting and began to publish MechWarrior: Dark Age novels in the Dark Age setting. The original board game line was re-branded Classic BattleTech by FanPro, who had previously held the license for German BattleTech products. They licensed the rights from WizKids in 2002 and continued to release sourcebooks and supplements under the Classic Battletech moniker. IP holder WizKids was purchased by Topps in 2003, and terminated as a brand in 2008 (the brand was since revived, but does not produce BattleTech-related material anymore); ever since, the IP to BattleTech (and others) are held directly by Topps. In June 2007, FanPro's license ran out and Catalyst Game Labs (a subsidiary of InMediaRes Productions, LLC) acquired the license to Classic BattleTech in their stead. Catalyst also retained many of the staff members who previously worked for FanPro. 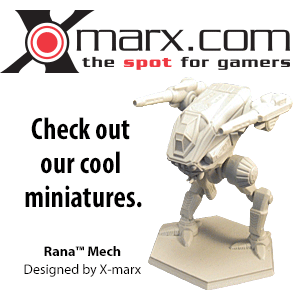 The "Classic" prefix was dropped again from new BattleTech products after the Dark Age line was discontinued in 2008. It remains in use to some extent, often to differentiate from the Clix game, and is now synonymous with the BattleTech board game. TechManual, which presents the design rules for making custom units. Campaign Operations, advanced rules for creating and running campaigns, and managing and running both mercenary and house military units. Catalyst has continued this line of rulebooks that was begun by FanPro. This page was last edited on 25 July 2018, at 01:20.